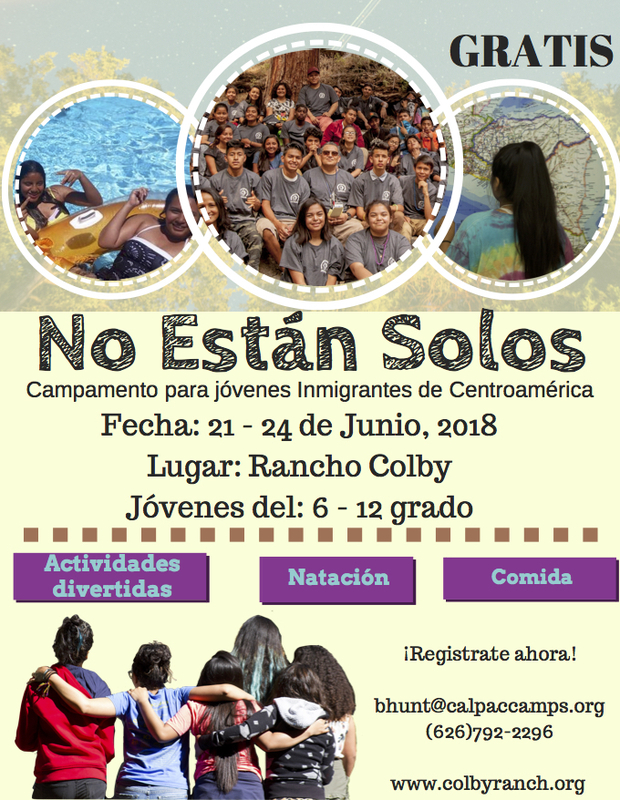 The purpose of this program is to work through our growing network of Immigrant Welcoming congregations to be an extension of God’s welcoming, healing embrace to the thousands of unaccompanied migrant children ( and their families) who have made the perilous journey from Central America to seek refuge among us. Our overarching goal is to reach out to these children and their families through United Methodist Churches located near them becoming places of welcome and healing for them through partnerships with community organizations. 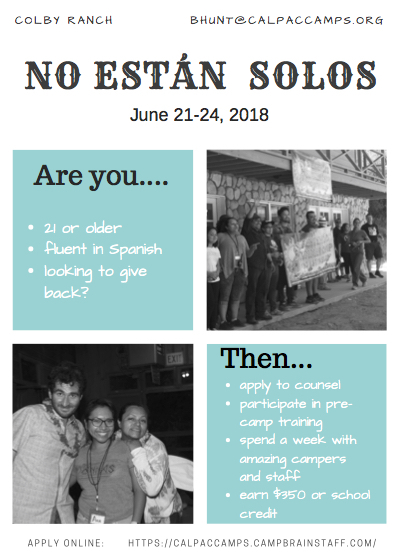 The 2018 No Estan Solos Camp is coming up once again this June 21-24, 2018, opening up the opportunity for those who want to make a difference to join staff or volunteer. These centers will provide services to resource families legally, relationally, and recreationally. 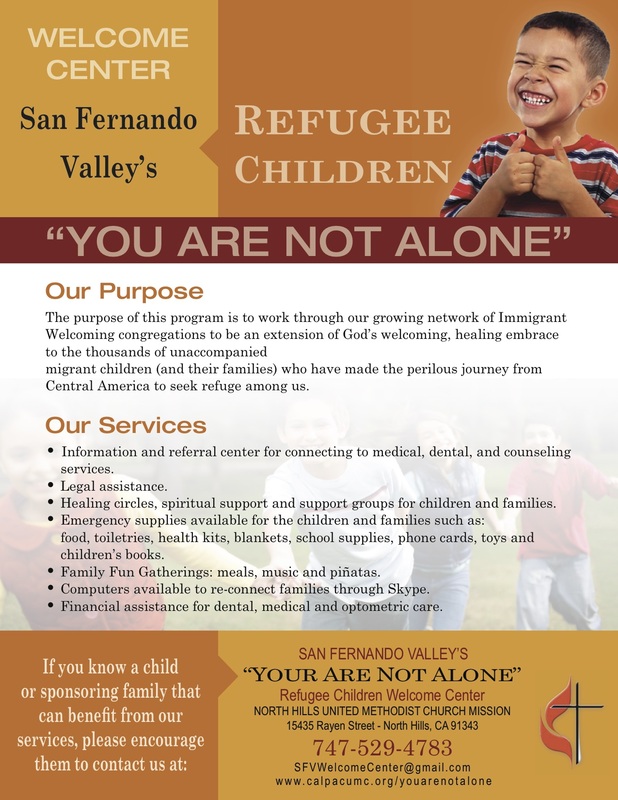 San Fernando Valley Refugee Children Center, Inc. Although the surge of unaccompanied minors at the border has subsided somewhat it is still estimated that over 70,000 children will have fled violence and impoverishment in Central America and made their way into the US by the end of this year. Also the push factors that have caused these children to leave their homelands have not changed and it is still more dangerous to be a civilian in Honduras, El Salvador, and Guatemala than it was in Iraq at the height of the war. It is expected that thousands of children and families will continue to undertake the harrowing journey. A large portion of these children would qualify for refugee status if provided the right legal representation and so we are beginning to see them arrive in our communities here in Southern California as they are placed with relatives and sponsors. This violent displacement of so many poor children from Central America is a disaster whose victims are arriving near the doorsteps of our churches. Their greatest need will be for post release services when they are placed with relatives or sponsors, particularly legal assistance, mental health, and other family support services. Southern California is receiving the second largest number of unaccompanied minors of any region in the country. We have heard that L.A. alone will be receiving at least 6,000. However our sources tell us these children are arriving in all areas of Southern CA and that there are still large numbers arriving in all of our counties and the services for those in outlying areas are even fewer. It is essential that we have a conference wide strategy so that our churches can be in ministry with the unaccompanied minors in neighborhoods throughout So Cal. It is said that more than 75% of these children suffer from post-traumatic stress disorder as a result of their horrific journey. Their relatives or sponsors are often poor and vulnerable themselves and ill-equipped to deal with such a challenge. They are provided no funds for legal assistance or other family services. May-June 2014: Surge of unaccompanied Central American children crossing the border due to violence and political upheaval. Would force DHHS to share guardian and family information of the UAC with ICE which may put extended family members in danger of deportation. a) There will be an Immigrant Welcoming Congregations Gathering for orientation and training related to Unaccompanied Migrant Children and their families and to strategize how to build relationships and partner with the community to provide services as well as act in solidarity with the families. b) Church Based – “You Are Not Alone” Migrant Children Welcome Centers will be established, one in each of the 4 California Districts. The churches where these Welcome Centers would be established will be chosen from our most strategically located and active Immigrant Welcoming Congregations, those who already have established relationships with the immigrant community. These centers would receive support from and be a resource for the broader Immigrant Welcoming Congregations Network. To serve as an info and referral center for connecting to emergency services, legal assistance, mental health, spiritual support and counseling services. To have on site emergency supplies available for the children and families such as: food, toiletries, health kits, blankets, school supplies, phone cards, emergency housing and transportation vouchers, toys and children’s books. To partner with the Pastoral Counseling Dept/Center at Claremont School of Theology and other mental health organizations to provide trauma support groups and other mental health and spiritual support on site and at other Immigrant Welcoming Congregations. To provide regular hospitality meals and celebrations to bring the congregation together with the children and families to continue to build a healing and supportive relationship and to let them know (without proselytizing) that that those seeking a community of faith are welcome to make the church their spiritual home. 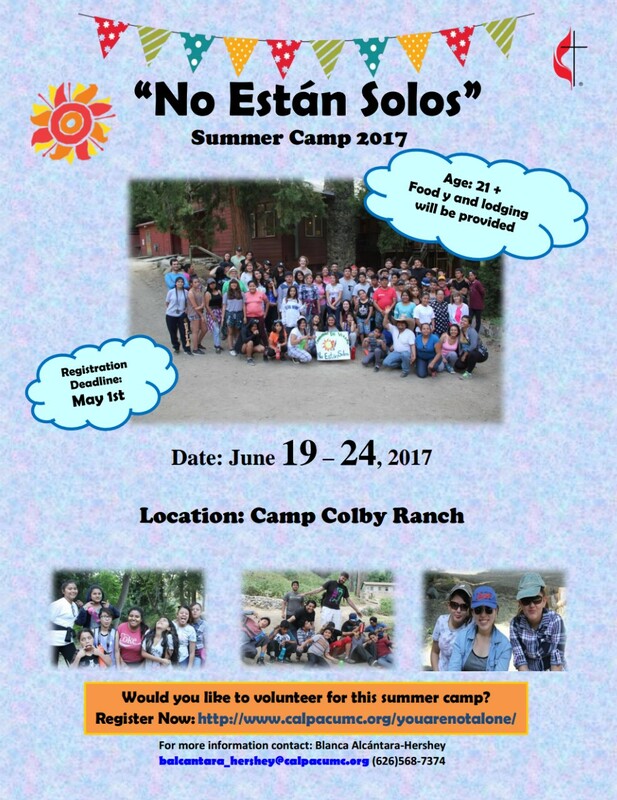 To assist in finding sponsors for unaccompanied minors. To gather together regularly as leadership teams at the 4 sites as well as with the broader Immigrant Welcoming Congregations Network for mutual support, trainings and to strategize for joint action regarding policies that affect migrant children and their families. 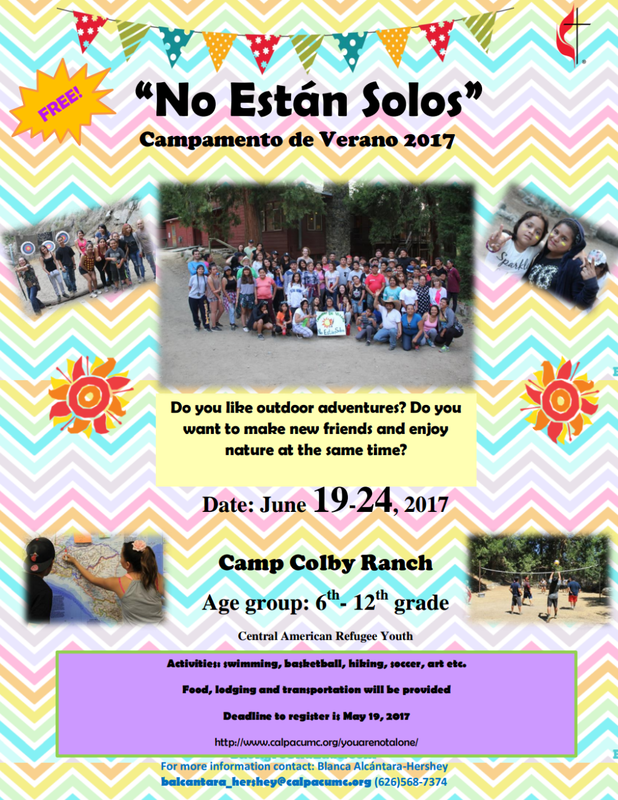 c) In 2015/16 we will partner with our Cal-Pac Conference Office of Camping ministries to provide 2 therapeutic camping experiences for migrant children and their families suffering from many forms of trauma due to their experiences of poverty, violence, the breakup of their family and their frightening journey here. The camps will be staffed by members from our Immigrant Welcoming Congregations and resourced by mental health workers and Claremont pastoral counseling students. Welcome Centers and Immigrant Welcoming Congregations would recruit affected families for the camp from relationships they have established in their neighborhoods. Relationships would be strengthened through the camping experience and continue through follow up at the Welcome Centers and the Immigrant Welcoming congregations following the camping experience.